The term "fetish" is defined as "an object believed to have a power greater than the object itself would naturally possess." (See the book Zuni Fetishes and Carvings by Kent McManis.) The carving of animal forms in stone and shell goes back to pre-historic times. While the carvings are much more realistic and animated today, their meanings have changed very little through the years. 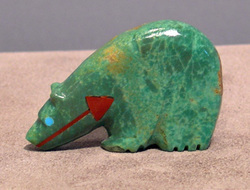 Whether one desires a bear for healing or a mountain lion for travel protection, each fetish brings a positive power and aesthetic appeal. We carry a wide range of exclusively Zuni fetish carvings, which is one of our specialties. We advise all our customers to purchase only Zuni or Pueblo carvings as most Navajo "fetishes" (outside of livestock carvings, wooden snakes and human figures) are merely copies of these other tribes' work. We specifically try to find unusual carvings and materials for our customers, and have both traditional and contemporary detailed carvings by a wide range of artists. Our website display comprises only a small sample of our inventory. From time to time, we have wonderful older fetishes by some of the master carvers of the past including Leekya Deyuse, Leo Poblano, Theodore Kucate, Edna Leki and Aaron Sheche, among others. See Kent's books Zuni Fetish Carvers: The Mid-Century Masters and Zuni Fetish Carvers of the 1970s for examples of their work. All Kent's books are available in our Books gallery.